The American Coots came back from their summer vacation this week. Not that they went far. 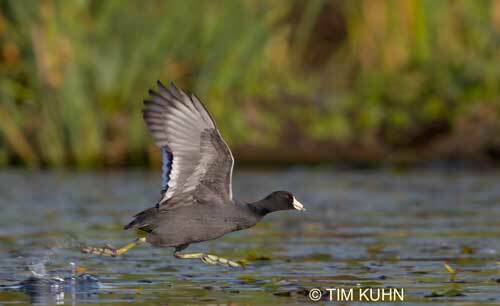 I think most of the coots that ply the waters of the Fill spend their summers on Green Lake. It’s not exactly the Far North. Somehow, though, the fact that coots go only a few blocks north during breeding season – when birds such as Arctic Terns routinely fly tens of thousands of miles – seems appropriate. Coots are goofy. Take the one that was on Main Pond the other day. It apparently saw a berry it wanted to eat near the shore and figured if it stood on the willow bough that stretched across the berry bush, it could dine in comfort. So, flapping its stubby wings and churning its size-10 feet, it lifted off the water and landed on the willow. Unfortunately, the willow bough was more of a willow wand and could not support the hefty weight of the coot. Down went the coot, only to rise up again as the springy willow obeyed Hook’s Law: the flexion of a spring is in direct proportion with the load applied to it. Coot and willow shot up like Greg Louganis executing his Gold Medal dive off the three-meter springboard. At the maximum extension of the branch, the coot’s hold on the bough broke, and the coot blasted off into space, squawking all the way. I think it ended up in Green Lake. This entry was posted in Uncategorized on September 2, 2012 by constancesidles.